Mr. Rigas is a founding shareholder of Energean Oil & Gas. He is a Petroleum Engineer with a combination of oil & gas and investment banking experience. Prior to setting up Energean Oil & Gas, Mr. Rigas spent 18 years in investment banking and has experience in Private Equity investments in oil & gas, project finance and shipping. Between 2001 and 2007 Mr. Rigas set up, and became the Managing Partner of, Capital Connect Venture Partners, a Greek investment fund. 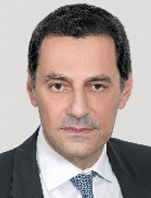 From 1999 until 2001, Mr. Rigas managed Piraeus Bank's Shipping Investment Banking division. As Vice President of Shipping, Energy & Project Finance at Chase Manhattan Bank in London (1993-1999), Mr. Rigas arranged financing in excess of US$5 billion, mainly in the oil & gas sector. He holds a Degree in Mining and Metallurgical Engineering from the National Technical University of Athens and an MSc / DIC Degree in Petroleum Engineering from Imperial College.